We must have the time to create strict rules so that property is not sold by Communist managers for a low price. They often get payments under the table to sell to the first bidder. This does not build public support for a market economy. We served on the editorial board of a literary monthly called Face in 1968 and 1969. He was a young writer, and I was also interested in broad cultural issues. We agreed on all major issues and became friends. By the time I returned to Czechoslovakia, I had an understanding of the principles of the market. I never intended to be a politician or office-seeker. To talk about planning an economic system is to talk in old terms, and I find myself sometimes having to teach Westers about what the market really means. I was paid to read Western economic texts. In a way, the regime paid for their own undermining. Then in 1969, I spent the spring term at Cornell University in New York. The invasion of August 1968 had already happened, but the hardline regime took several months to crack down on dissidents. We will also allow state companies to sell shares to their workers and will pass a law allowing citizens to start companies of their own with no limits on the number of employees or on the firm’s output. It is what makes the reform process an art, not just a science. You have to develop a strategy that tells you what reform measures you should follow and in what sequence. 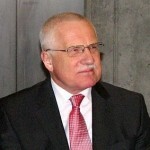 Václav Klaus is the second President of the Czech Republic. He was Prime Minister of the Czech Republic from 1992 to 1997.